The aim of Shaping Bright Futures is to build compassionate partnerships between families whose needs are consistently met and children in countries affected by conflict and widespread poverty. We are dedicated to bringing hope to these children through the provision of basic essentials such as education, life skills, nourishing food, and drinkable water. SBF harnesses the resources and generosity of families in developed nations and delivers these gifts of compassion to those who need them most. The work of SBF also empowers both the donors and recipients with the knowledge that thoughtful and caring actions can have a positive global impact. Make a donation to Shaping Bright Futures today and see how YOUR small, caring action can reach around the world. Here is what your donation can do! All donors who contribute at the Friend level will receive acknowledgment for their contribution in the form of a brick inscription at the classroom entrance. All donors who contribute at the Associate level will receive acknowledgment for their contribution in the form of a plaque inscription at the classroom entrance. All donors who contribute at the Supporter level will receive acknowledgment for their contribution in the form of a plaque inscription on an athletic field. All donors who contribute at the Humanitarian level will receive acknowledgment for their contribution in the form of a plaque inscription on the well. All donors who contribute at the Patron level will receive acknowledgment for their contribution in the form of a commemorative plaque on the main entrance gate to the school. All donors who contribute at the Benefactor level will receive acknowledgment for their contribution in the form of naming rights for the library. All donors who contribute at the Founder level will receive acknowledgment for their contribution in the form of naming rights for the school building. As you can see, any donation – large or small – small can make a big difference. SBF strives to put 100% of your donation toward tangible goods for the people in the village of Buaw. Therefore, all donations will go into a general fund for the school building unless a donor has specifically designated where he or she would like the money to go or has donated funds at a Major Contributor level. If you have any questions regarding how your donation will be used, please contact us. Shaping Bright Futures is a 501(c)3 nonprofit organization and donations may be tax deductible. Mathew Riek was born in a small village in Sudan. In 1988, when he was approximately 12 years old, Mathew was separated from his family during a civil war that destroyed his home and robbed him of his parents. Alone and unsure of what the future held, he joined thousands of other boys and walked for three months to the Ethiopian border. The boys had hoped to find peace in this new country, but only found more war. After four years in a refugee camp in Ethiopia, the Ethiopian government fell, and the boys were forced to flee for their lives once again. They walked back through Sudan in an effort to reach safety, but the Sudanese government bombed the camp where the boys were staying and took some of the young men captive. Mathew was among the few who escaped. The surviving boys continued to walk and finally reached the country of Kenya after a total of four years spent in the wilds. He spent the next nine years in Kakuma Refugee Camp in northwestern Kenya. In 2001, Mathew was one of the 4000 Sudanese Lost Boys selected to come to the United States through a resettlement program. In the years since Mathew arrived in America, he has worked hard and taken advantage of the many opportunities presented to him. His passion for education enabled him to earn his high school diploma, a Bachelor’s degree in Philosophy and a Master’s degree in Public Administration. Ever grateful to America, his ultimate dream is to share the product of his good fortune with the people back in his former homeland. He plans to do this by building a school so they too can benefit from the skills, sense of purpose, and hope for the future that come with receiving a sound education. Shaping Bright Futures is proud to announce our scholarship program starting in the Spring of 2018. When Mathew visited Uganda in 2017, he met several University students who were from his home village in South Sudan. He learned that these students left South Sudan because of the war and have moved to Uganda in hopes of receiving an education. Many of these students, however, are unable to complete their studies because of financial difficulties. When SBF learned of these students, we knew we wanted to help in some way. We established the Miguel Martinez University Scholarship, named after a brilliant young man, who was a friend of SBF and tragically passed away during his first year of University studies. It is our hope that each recipient of a scholarship will complete his or her studies and pay it forward by helping others complete their education. Pictured above: The land that has been given to SBF by the local government to build the school; An arial visual of the proposed school; Classroom; Rendering of the school farm where the students will learn about agriculture and produce goods to sell at the market-final image. Changing the world, one brick at a time. In an effort to realize Mathew’s dream of providing stable education for the children of South Sudan, SBF’s first project is to build a school near the site of his former village of Buaw in Unity State. There are currently no educational institutions in Buaw and children attend school under a tree. During the rainy season and times of extreme heat, the children are unable to go to school. It is SBF’s goal to build a permanent structure so children will be able to attend school throughout the year and receive steady, ongoing education. The school will also provide training in the form of practical life skills to the adult villagers that they can use to improve their own livelihoods. The residents of Buaw will assist as advisors to the project and many will actively participate in building the school as laborers and suppliers of materials. This SBF project will give the people of Buaw the experience needed for them to build other permanent structures, such as clinics and community centers, thus giving the entire village a sense of permanency, stability, and hope for a brighter future. SBF has had the pleasure of working with an extraordinary architechture firm, XCOOP, which has helped translate our vision of the school into concrete images. Talented and innovative architects Andrea Bertassi and Cristina Murphy, along with Cody Johnston and Edgar Irakiza graciously gave of their time and talents to create the beautiful images of our future school seen on this page. This team shares our vision of improving livelihoods through education, advocacy and innovation. Shaping Bright Futures is always looking for people who share our mission to meet the needs of children in countries affected by conflict and widespread poverty by providing education, life skills, nourishing food and drinkable water. As greatly as monetary donations are needed, the gift of your time and talent are also valuable contributions. Consider hosting events such as garage sales, bake sales, car washes, can recycling or lemonade stands and donating the proceeds to Shaping Bright Futures. This is a great opportunity for schools or families to work together and teach our kids the importance of service and demonstrate to them how caring actions can have a big impact globally. You may also be able to claim the donations on your tax returns. Part of the mission of Shaping Bright Futures is to reach out to our youth and empower them with the knowledge that they have the ability to make a difference in another person’s life through small, caring actions. As such, we offer the SBF School Outreach program. Upon request, a representative from Shaping Bright Futures and a Lost Boy of Sudan will visit your school or classroom and educate the students about our project in South Sudan and demonstrate how they can help turn this dream of building a school into a reality. The students will receive a brief lesson on the history of Sudan and the impact the 20-year civil war had on the country through a personal story from one of the Lost Boys of Sudan. The SBF representative will also introduce the “One Brick at a Time Classroom Challenge” to the students. This program visually demonstrates to the students how a small sacrifice (like the cost of a brick) may seem insignificant, but when added together can accomplish something big like building an entire school. All materials for the One Brick Challenge are provided free of charge to teachers and/or schools who would like to participate in this uniquely rewarding fundraising activity. If you are interested learning more about the SBF School Outreach program or scheduling a free presentation for your organization or class, please contact our Outreach Coordinator. Unpaid internship positions are available for passionate young adults who would like their volunteer experience to be applied toward college credit. Responsibilities include program development, writing newsletters, grant writing, updating social media and fundraising. Where small, caring actions can reach around the world! Shaping Bright Futures, Inc. is a San Diego based non-profit dedicated to debunking the myth that a single person’s actions cannot make a difference in the lives of others. Many people mistakenly believe that significant and positive change can only be brought about by large organizations that have a lot of time and resources. The reality is that small contributions by numerous individuals can be the driving force behind meaningful change. If you want to give to others, but don’t feel like what you have to offer is enough to make a difference, Shaping Bright Futures can help. Whether it be through donations of your time, talent, or money, SBF will demonstrate that your actions can impact the lives of impoverished children across the world. A single contribution, big or small, may seem insignificant by itself, but when combined with others can transform people’s futures thousands of miles away. 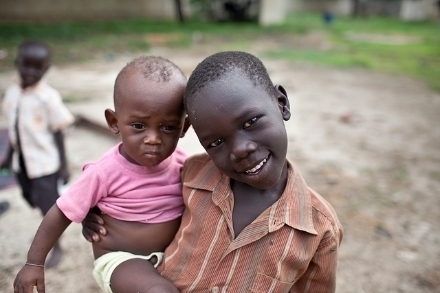 SBF is aware of the ongoing conflict that erupted in South Sudan in late 2013. 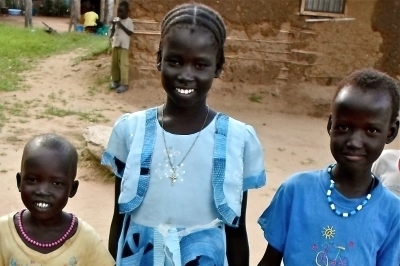 All of us at SBF pray for the South Sudanese people who are suffering so greatly. We are hopeful that the leaders of the country can find a peaceful solution so this new country can rediscover its bright future. We are so thankful to all of our donors who continue to show such faith and support in our school project. While the building of the school will continue to be a goal of SBF, we recognize that our priorities must shift in response to the conflict that has plagued South Sudan for the past several years. Although we would like to break ground on the school, SBF feels strongly that it would not be a prudent use of the funds that have been so generously given by our supporters to build at this time. Rather, we would like to acknowledge and assist those who are trying to persevere through the trials of living in a war torn country through receiving an education. SBF recently learned of an incredible little school in Kartoum, Sudan that is trying to offer school to children who have fled their country of South Sudan because of the civil war. The school is run by a man named Daniel. He is a friend of Mathew's. They grew up in the same village and became Lost Boys together when they had to flee their villages due to Sudan's horrific civil war. They traveled over 1000 miles together as young boys and lived in refugee camps together for years. Daniel has been living in Kartoum, Sudan for the past several years. He began to notice children in the streets during school hours. One day, he realized that the children were refugees escaping the war in South Sudan. They were unable to attend the schools in Sudan because they are Christian and the schools are Muslim. Dan knew he had to get these children off of the streets and into school. Dan began asking existing schools if he could use their buildings after hours to start a school for the South Sudanese refugee children. He finally was able to secure a building and Good Hope Primary School opened up for business! Today, Dan and 17 volunteer teachers school over 365 children. 27 of these students are orphans that the school administration takes care of. Dan and his teachers have also started a program to educate mothers as well. When Mathew presented this project to us, SBF immediately knew we wanted to help. To date, through the generocity of our supporters, we have been able to help Dan register Good Hope Primary School. Meaning, when and if the students leave the school, their credits will be transfered to other schools. In addition, we have committed to help pay the volunteer teachers and provide uniforms to the orphans. It all began with a question. When Abbie Wauson was in the fourth grade, she was given an assignment to read a book called Brothers in Hope by Mary Williams. It tells the story of two little boys who had to flee from their homes in Sudan to escape a civil war that destroyed their villages and took their families. With nowhere to live and no one to look after them, they walked together with many other boys who also lost their families for one thousand miles until they reached a refugee camp in Kenya. These children, who ranged in age from 4-14 eventually came to be known as the Lost Boys of Sudan. After reading this incredible true story, Abbie had many questions including the one that set Shaping Bright Futures in motion: “Where are the Lost Boys of Sudan now?” Abbie and her mom, Molly, who went on to become a co-founder of Shaping Bright Futures, learned that there were many Lost Boys living in their home town of San Diego, California. Abbie wrote to a local organization and asked if someone could come to her class and tell them more about the Lost Boys. Mathew Riek volunteered and came to speak to Abbie’s class. In addition to telling the children firsthand what it was like to have been one of the Lost Boys, Mathew also shared his dream of returning to his home village in Unity State, South Sudan to build a school for the children there. Abbie and Molly knew they could not build a school on their own, so they partnered with Mathew and an education company headed by Justin Price and Mary Bratcher to form Shaping Bright Futures. With the help of a team of incredibly talented and caring people who share the philosophy that small caring actions could reach around the world, SBF has set out to make Mathew’s dream a reality. SBF is writing a book! SBF is excited to announce our partnership with a talented young artist, Miriam Winters. Together we are working on a children's story based on Mathew's journey as a child as one of the Lost Boys of Sudan. 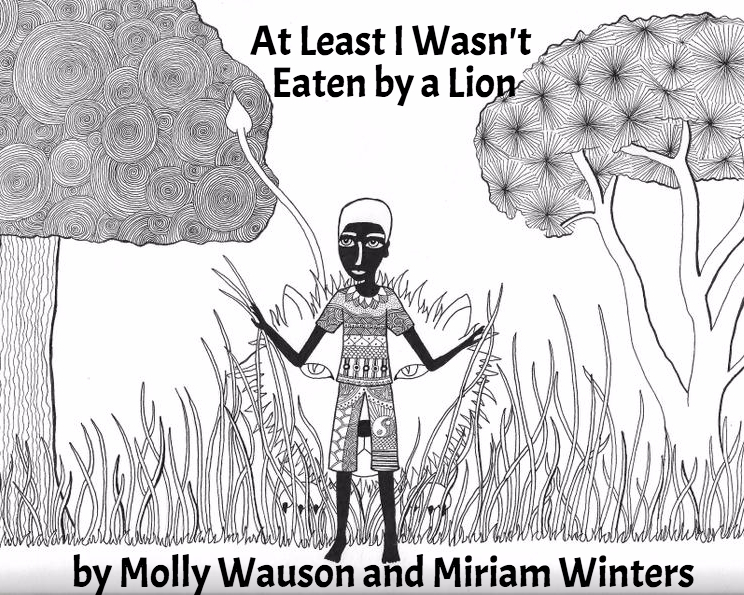 Here's Miriam and a preview of Mathew's story, At Least I wasn't Eaten by a Lion. The Shaping Bright Futures Scholarship was established in response to the current conflict in South Sudan which has displaced so many of its citizens to refugee camps and neighboring countries. SBF has long held the belief that education will play a vital role in the future of South Sudan. The SBF Scholarship will be awarded to individuals who have been displaced because of the civil war in South Sudan and are attending or would like to attend university. Current fundraising efforts are geared towards funding this scholarship. More information including the application will be available soon. SBF is excited to announce our collaboration with XCOOP, an architecture firm that conducts research and engages in advoacay in areas such as education, design, construction, social policy and strategy, economics and technology issues. Talented architects Andrea Bertassi and Cristina Murphy along with Cody Johnston and Edgar Irakiza have graciously agreed to help SBF with the design of our school. Visit XCOOP.org to see more of their incredible work! Thank you XCOOP! It looked like a typical garage sale in the Clairemont neighborhood. The tables were covered with used household goods, and kids were selling hot chocolate for 25 cents following a Saturday morning downpour. The only thing that seemed different here was a white van parked on the street that had "Southern Sudanese Community Center" hand-painted on the side, along with a flag I didn't recognize. The garage was attached to a house owned by Molly Wauson, and the sale was raising money to build a school in South Sudan. Molly Wauson is a St. Didacus parent who is applying for 501c3 status for a non-profit called "Shaping Bright Futures." The inspiration arrived last year when her 4th grader, Abbie, wrote an essay about the people called the "lost boys" of Sudan. Soon after that she met a man named Mathew Riek, a former lost boy who ended up living in San Diego. Abbie and her mother were riveted by Mahtew's story, and they were inspired by his dream of building a school in his home village in South Sudan. That was when Molly Wauson began fundraising at a variety of places, including St. Didacus. "The kids at St. Didacus were incredible!" said Wauson. "They raised over $850 by bringing in their jars of pennies." Mathew Riek is a smaill man with a slight build whose ebony face is animated by frequent smiles. His pleasant, peaceful nature seems at odds with the story of violence and desperation that ruled his childhood. "I dodged bullets. I walked in the desert with lions in the cover of the dark night. I starved and was thirsty, and was so tired." he said. Riek says he was a goat herder as a boy in his native village of Buaw. But Sudan's internal war sent Riek on the run at the age of 12. After walking for what he said was a thousand miles he found refuge in a camp in Ethiopia. But political warfare in that country drove him out again at gunpoint, and he returned to Sudan by crossing the infamous Gilo River, with its dangerous rapids and man-eating crocodiles. He lived in a camp in Sudan until the government sent planes to bomb it, and Mathew Riek fled once more, finally ending up in Kakuma refugee camp in northern Kenya. He survived nine years there, often having to fight with other residents over the rations of food and water. But eventually some American charitable groups arrived with the promise of resettlement. He remembers having to write an essay about his experience, memorize it and then meet with a representative of the Immigration and Naturalization Service (INS). "You had to tell your story to the INS and try to get it right, because if you don't tell the story the same way as you wrote it you might not come to America," he recalls. Mathew did make it to America after being sponsored by Catholic Charities. Now he's focused on building his life and partnering with Molly Wauson and others to build a school in his village. Wauson said thaey are looking at an overall cost of at least $30,000 and their philosophy is to build it one brick at a time, at $3 a brick. "We are using the people in Mathew's village who learned in the regugee camp how to make their own bricks," she said, adding that there will be considerable expense in providing and transporting materials. Wauson said children in Mathew Riek's village need the walls and the roof of a schoolhouse to make instruction consistent. Now, the kids have their lessons under a tree and they can't hold classes during the rainy season or when it's too hot. Riek adds that education is the first priority for helping the kids of South Sudan, where the official illiteracy rate is 73 percent, though he expects it's acutally much higher. As for his own family, Riek said that he lost his father and his mother. All that is left of his family are his three sisters. "My sisters don't have a home. They don't have an education. But thank God they're alive."